Chad Heatwole, MD, MS-CI is a neuromuscular clinician and researcher from the University of Rochester. 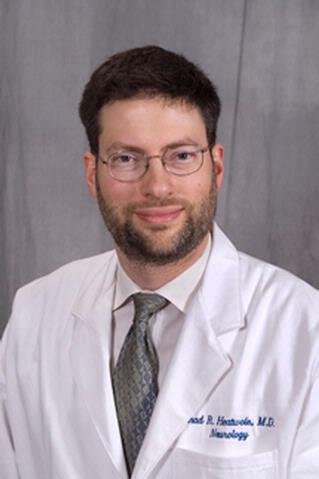 He has an engineering degree from Virginia Tech, a medical degree from the Medical College of Virginia, a master's degree in clinical investigation, and has completed a University of Rochester neurology residency, electrophysiology fellowship, and NIH-funded neuromuscular experimental therapeutics fellowship. His research funding has included a National Institute of Arthritis and Musculoskeletal and Skin Diseases K23 award, a Muscular Dystrophy Association TRIG award, and a New York State ECRIP award (among other awards). Dr. Heatwole's research has led to the development of an international network dedicated to improving the quality-of-life of neuromuscular patients through patient-centered clinical research. His primary professional interests include providing optimal care to patients with neuromuscular disorders, performing electrodiagnostic studies, training medical personnel, evaluating novel experimental therapeutics for neurological diseases though clinical trials, and developing an improved infrastructure to utilize disease-specific, patient-relevant endpoint measures for use in clinical trials and patient monitoring. As a neurologist with sub-specialty training in neuromuscular medicine, electrophysiology, and experimental therapeutic development I am committed to: 1) providing optimal care to patients with neurological and neuromuscular disease; 2) teaching students, residents, and fellows; and, 3) training faculty in therapeutics and outcome measure development research. My main focus is in the management and diagnosis of patients with muscular dystrophy. Working in a well-established Neuromuscular Disease clinic at URMC, I have been able to develop a patient referral base from across the United States and from multiple countries throughout the world. My "myotonia clinic" now forms a key resource for patient recruitment and therapeutic care at the University of Rochester. In addition, I am partnering with patients and potential donors to develop a myotonic dystrophy type-2 research and clinical care center of excellence at the University of Rochester. One of my primary research interests is in the development, validation, and analysis of patient relevant outcome measures for use in drug labeling trials. Current work from my laboratory involves the development of disease-specific, relevant, valid, responsive, reliable, clinical trial instruments for myotonic dystrophy type-1 (DM1), myotonic dystrophy type-2 (DM2), congenital myotonic dystrophy (CMD), juvenile myotonic dystrophy (JMD), Charcot-Marie Tooth 1a (CMT1a), inclusion body myositis (IBM), and facioscapulohumeral muscular dystrophy (FSHD). My research is also focused on the development, evaluation, and testing of novel experimental therapeutics for neuromuscular disease. We are currently running a single-center, FDA-funded, placebo-controlled study of mexiletine for myotonic dystrophy type-1. Our group has also evaluated recombinant human insulin-like growth factor 1 for muscular dystrophy, IVIG vs. plasma exchange for myasthenia gravis, thymectomy for non-thymomatous myasthenia gravis, and performed a comparative analysis of multiple immunosuppressive agents for dermatomyositis. Most recently I have received NIH U01 funding to longitudinally study FSHD patients over a 3 year period to develop responsive and meaningful outcome measures for this population. As a natural extension of this study, I have applied for NIH U34 funding (decision date: Spring of 2014) to test combination therapy of two promising endocrine therapies in this population. Prior work has shown that multimodality treatment with testosterone and rHGH has potential as a mechanism to bolster strength, lean body mass, and function in select populations; yet this promising treatment strategy has not been evaluated in FSHD. This planning award, conducted with experienced investigators, will allow for a multicenter clinical trial to evaluate the benefit and tolerance of this promising treatment for FSHD patients. If gains in muscular and physical function are of similar magnitude in FSHD as they have been in other populations, this discovery would significantly improve therapeutic options for FSHD patients and may provide an option for patients with other musculoskeletal disorders. University of Rochester Master Mentors Program. Guber RD, Kokkinis AD, Schindler AB, Bendixen RM, Heatwole CR, Fischbeck KH, Grunseich C. "Patient-identified impact of symptoms in spinal and bulbar muscular atrophy." Muscle & nerve.. 2018 Jan 0; 57(1):40-44. Epub 2017 Sep 25. Statland JM, Heatwole C, Eichinger K, Dilek N, Martens WB, Tawil R. "Electrical impedance myography in facioscapulohumeral muscular dystrophy." Muscle & nerve.. 2016 Oct 0; 54(4):696-701. Epub 2016 May 25. Wolfe GI, Kaminski HJ, Aban IB, Minisman G, Kuo HC, Marx A, Ströbel P, Mazia C, Oger J, Cea JG, Heckmann JM, Evoli A, Nix W, Ciafaloni E, Antonini G, Witoonpanich R, King JO, Beydoun SR, Chalk CH, Barboi AC, Amato AA, Shaibani AI, Katirji B, Lecky BR, Buckley C, Vincent A, Dias-Tosta E, Yoshikawa H, Waddington-Cruz M, Pulley MT, Rivner MH, Kostera-Pruszczyk A, Pascuzzi RM, Jackson CE, Garcia Ramos GS, Verschuuren JJ, Massey JM, Kissel JT, Werneck LC, Benatar M, Barohn RJ, Tandan R, Mozaffar T, Conwit R, Odenkirchen J, Sonett JR, Jaretzki A, Newsom-Davis J, Cutter GR, . "Randomized Trial of Thymectomy in Myasthenia Gravis." The New England journal of medicine.. 2016 Aug 11; 375(6):511-22. Chapter Title: Channelopathies: Myotonic Disorders and Periodic Paralysis. Book Title: Swaiman's Pediatric Principles and Practice 5th edition. Author List: Heatwole, C; Moxley, R.